His works are integrated in the permanent collections of: Vicente Blasco Ibáñez Museum of Valencia, National Museum of Theater, National Museum of Natural Sciences, National Museum of Roman Art of Mérida, Provincial Museum of Cáceres, Provincial Museum of Fine Arts of Badajoz, Museum National Aeronautics and Astronautics, Army Museum (Alcázar de Toledo), Maritime Museum of Asturias … One of his portraits of Ángel Ganivet rests at the headquarters of the Association of Friendly Countries in Finland, another in the Casa-Molino Ángel Ganivet of Granada (Provincial Documentation Center). Two of his portraits of Alejo Carpentier and Nicolás Guillén belong to the National Union of Writers and Artists of Cuba. 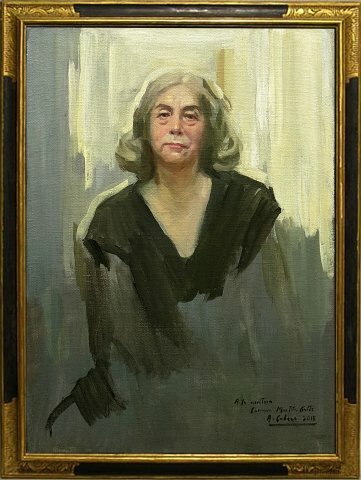 His portrait of Ana María Matute remains exposed at the headquarters of the Royal Spanish Academy in Madrid. One of his portraits of Antonio Machado belongs to the author’s Museum House in Segovia (for which he watches the Royal Academy of San Quirce). A second portrait of the poet belongs to the International University of Andalusia. A portrait of Miguel de Unamuno of his authorship belongs to the University of Salamanca and rests in the author’s Museum House. One of his portraits of Gabriel y Galán is part of the collection of the author’s Casa Museo in Guijo de Granadilla (Cáceres). His portrait of the poet Antonio Carvajal is patrimony of the Academy of Good Letters of Granada. His portrait of Mario Vargas Llosa belongs to the University of Burgos. His portrait of Ramón Gómez de la Serna is part of the collection of the Contemporary Art Museum of Madrid. The portraits of Miguel de Cervantes of his authorship rest in the Museum-House of Cervantes de Esquivias (Toledo) and in the house Museum of Cervantes de Alcalá de Henares. A third portrait of Cervantes, property of the Museum of History of Madrid.